Contact Us for a FREE trial! Had a great time at the Burlington Royals exhibition game with the Kernersville Bulldogs. My son is learning a lot and he loves Mathnasium. Mathnasium has been a huge part of our math success in all areas. My one regret is I didn’t start my kids earlier. The staff Is wonderful and very helpful. Thank you for changing lives and creating a space for more learning and less crying. Mathnasium of Burlington has amazing employees. My 14 year old daughter is always excited to go - that says it all!! My son has struggled with Math and he is now showing the ability and confidence to do simple math in his head in public (and he is right). I cannot say enough great things about Mathnasium, especially Jennifer! We have tried other tutoring services for my kids - private and business - and have seen the best results with Mathnasium. With Mathnasium's help, my daughter achieved the grade she needed in precalculus. They are very flexible with scheduling and did everything possible to accommodate my daughter's busy schedule. We will most definitely will be using Mathnasium again! My daughter has gained so much knowledge and confidence in the few short weeks at Mathnasium. She even looks forward to going there after school! My daughter has come such a long way from when she started about 10 months ago. She went from a fearful, tearful young lady walking into the doors because she had been so beaten down by math over the years. She now goes willingly and happily! Everyone there is so friendly and nonjudgmental. She’s gone from a “D” student in math to a “B” student. And rarely needs my help with homework! Best decision I’ve ever meet .. Jennifer is an angel she’s always willing to help .. They are very professional, and very friendly. Also they work very well with the kids. They also motivate the kids in a fashion that makes them want to learn. Great experience and my son is learning and improving so much. The team is excellent and always friendly. They have helped my son jump math levels since he's been going. If you have a child struggling in math I definitely recommend coming to Mathnasium! The instructors give them confidence that they can solve the problem. And they show them different ways of figuring out the problem. My child seemed to grasp the concepts better at Mathnasium. And in turn, gave her the confidence she needed going into the end of grade testing. And that confidence helped her achieve a great score. Mathnasium increases math confidence! We love how Mathnasium has helped our children understand the logic and order of all things math-related! Super experience! The staff was very in touch with our daughter's needs and gaps. They worked with her and established a positive relationship quickly. 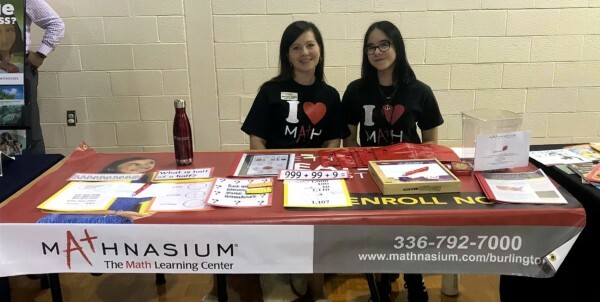 We would definitely encourage other families to pursue Mathnasium! My son loves it here and he is doing so much better in math. Mathnasium was a wonderful experience for our daughter. She was quickly made to feel welcome and a part of the family there. She felt valued in so many ways other than the math curriculum. At the end of the math course, we were so happy with our daughter’s math successes and improved grade, but even more thrilled with her improvement in other areas- confidence, attitude and responsibility. We will always be grateful to the staff and teachers at Mathnasium for this! My 14 year old twins have been going to Mathnaseum for tutoring for over a year now... they are growing in confidence and mathematical abilities.. they also have a really fun time and have met some great people. Thanks Mathnaseum!!!! Jennifer and her team are fantastic - in just a few short weeks, my daughter’s grades and confidence are rising. Thank you, Jennifer! My kids have been going for several years now. It provides, structure, consistency and focus to the math curriculum! The teachers are great, and schedules are flexible! The people that work there are great. And they really care for there students education as far as math is concerned. My son seems to be making steady progress with his confidence in math. The staff seems courteous and attentive. Mathnasium was a God send for my son! With block schedule, if you get behind, you're doomed! But with Mathnasium, he caught up and got a better understanding of what and how to do his math. They were proactive in tackling the problem at hand and going back to pin point the time of derailment. I highly recommend them whatever your math needs. Any age any type of problems. They won't fail you. Our son truly looks forward to his time at Mathnasium for ACT/SAT Prep tutoring. He feels he is solidifying concepts, as well as learning shortcuts and tips he's not previously learned. We're very happy with our time at Mathnasium! My son has been struggling with geomerty. Since he's been attending Mathnasium, his test grades have come up and he has a better understanding of what and how to do his math. Its been a Godsend for our family! Mandy loves going to Mathnasium. I have been very happy with the improvement in my granddaughter.She is always happy knowing that she has someone to help her with her class work.We just need to get there more often. Staff is very empathetic with all levels of learning and the needs and concerns of parents and children. Great instructors and good programs to help your child have confidence and succeed at math!! It's been a tremendous help to our daughter to fill in gaps in her math learning. It has helped my son quite a bit however it would be great if you could bring them on an hourly basis as opposed to a monthly charge. I hate to pay the monthly rate and something happen and we not be able to get there enough times. Good Instructors. My daughter likes going there. Would prefer the curriculum to go more along with what she is doing in school. Overall a good math tutoring organization. Obvious improvement in my daughter's since starting Mathnasium a few months back. The one on one tutoring with focusing on her specific needs has been helpful. My daughter's grade at school has been improving as well as her love for math. Great people, not intimidating at all. Kids feel comfortable with asking questions. My son has never liked math...EVER! He actually asks to go to Mathnasium after school now. I have had great customer service experiences, and seen immediate improvement on my son's ability to master concepts. It's early in the experience for us, but to see my child actually enjoy learning, is something invaluable. I can see a improvement in Lukes math no longer than he has been there. He still has a way to go but I have confidence in Mathnasium. Since attending Mathnasium, my son has gained a firmer grasp of math concepts and become more confident in approaching math in general. Attending tutoring sessions with his teachers after school did not help him improve his grades or his confidence. After turning to Mathnasium, the tutors there were able to do what school and extra help after school could not. Homework time stopped being a frustration session ending in tears. The best moment was when we were was able to share with the staff that a failing grade in Algebra was improved to an A!